Give your DJ Hero for the PS2, PS3, and 360 a new look with an amazing Diamond Plate Silver designed skin kit. Our skin kits cover the front of your DJ Hero for the PS2, PS3, and 360. We've design our skin kits with no limitations to provide you with the most protection possible. Our skin kits are digitally engineered to provide cut outs for the most essential areas. 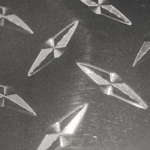 A brilliant, smooth mirror metallic finish in a beautiful Diamond Plate Silver. Rich in depth, clarity, and color with a brightness that never weakens from any angle or distance.